Should You Sell Your Stocks? Market is in flux, things are scary. Should you sell? If you’re young like me, no. Even if you’re older, probably not. Stay diversified. What good is having bonds if you sell them when the market is up? You won’t get the benefit when the market goes down (you’ll be buying too late). 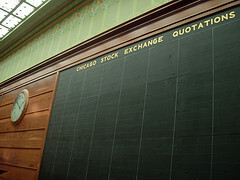 What good is having stocks if you sell them when the market is down? You’ll be late to buy when the market goes back up. There may be some major craziness, but hang in there. Just make sure you continue to diversify properly based on your age and risk tolerance. Your moment of zen in the crazy stock world. Of course, I’m not a professional financial adviser but that’s what many of them are saying too. Great post. I’ve heard of too many people in panic mode selling and losing a lot of money that they would have recovered. I remember years ago seeing charts of the market from the Crash of 1929 to the then present. People who held on to their stocks made money years later. The crash was mainly because so many people who leveraged to buy stocks were forced to satisfy their short sale when the price went down. Get good professional advice before you do anything in this kind of market. I’m putting any extra cash I can scrounge up … into BUYING right now! It’s hard to stay focused when the media and papers are touting this as a financial disaster and we can’t seem to find the end in sight. Diversification and patience are what we can bank on through this crazy market. We know in time our investments will be worth more and through diversification we will not expose ourselves to much. It’s tempting to buy some beating down bank stocks, but how do we know if this is the end? We won’t for a number of months. I really enjoy reading your posts and hope you write more about the financial markets.